Living in India, one is easily progressed into a culture that the country is steeped in and identified with, a culture that eventually grows into us. But how culturally aware or poignant do we become over time is a question of debate. As much as our beliefs and practices reflect our sensibilities, we often tend to ignore the value that comes with our culture and more importantly to study it in a broader perspective. These reflections may rather be substantial reactions to my recent migration from India. They also, seem to be more serious and emotional outbreaks of a drastic cultural change owing to the profession that I come from – the Indian performing arts! The fuelling also comes from a series of seminars that I have been able to attend and ignite a thought process of seeing India in a diaspora. 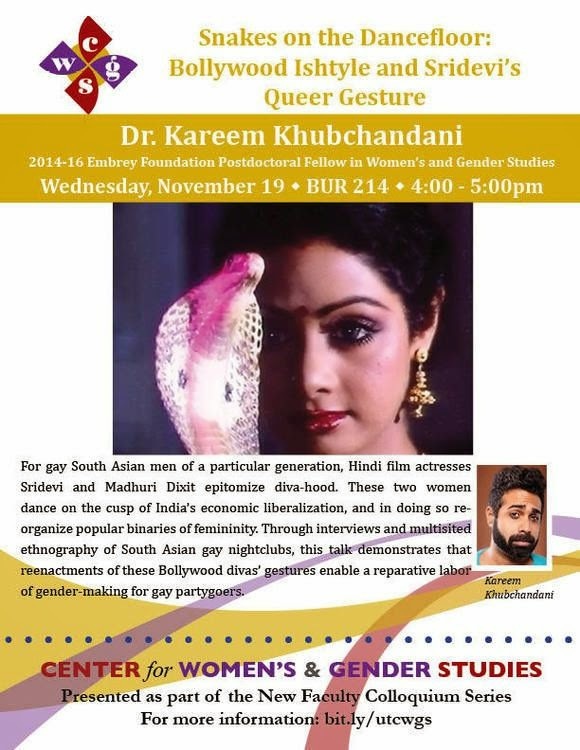 Department of Asian Studies at the University of Texas at Austin recently hosted ‘Snakes on the dance floor – Bollywood Ishtyle and Sridevi’s queer gesture’ – by Dr. Karim Khubchandani as a part of new faculty colloquium. If the title was inquiring enough, the talk went a great course into absorbing cultural notions of the gay community across India and the U.S.
Dr. Khuchandani captured the essence of a cult in a narrative of his own, traversing through varied emotions and ‘possessions’. He rightly put it as Bollywood ‘Ishtyle’- a vocabulary coined to describe gay possession towards emulating the famed ‘Snake dance’. His paper for me, was awe-inspiring in his analysis of communal culture and emotion, dance and its expression and perception and liberalization of women in films! Points of introspection ranged from how accents signal regional differences and gestures constitute an alternative vernacular isolated from the body. This expression in particular appealed to me as a new way of looking at the art of communication - especially in the performing arts which use a whole lot of gestural and body movements! Bollywood dance was charted through a journey where it developed a vocabulary of its own and created a unique place for heroines in the industry. The paradigm shift of the typecast of women from the ideal wife material to the cabre dancer to the Diva and finally worshipped as ‘Goddess’ was very well sketched much to a huge applause. This being the case, he explained how the ‘Snake dance’ which actor Sridevi was personified with in Nagina and multiple future adaptions of the same yet, gradually became eminent part of party dancing. A series of interviews with gay practitioners across Bangalore and Chicago brought forth gay obsession for this type of dancing. The description included an insight into the emotional value attached to these dances and a cult that is creating its own niche. Well, if it was anything for me, a wonderful initiation into reflecting on India and its culture from a wide angle, never attempted before! 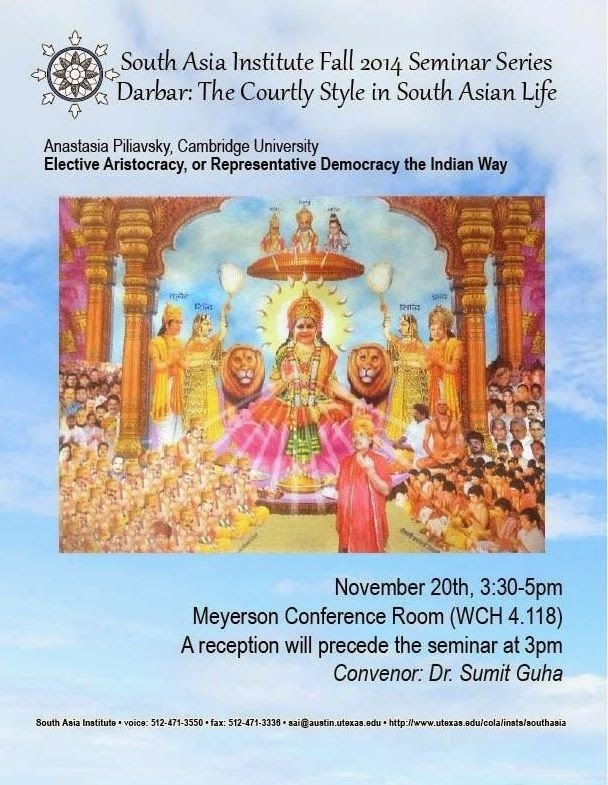 While in the same groove, a brilliant academic inquiry into ‘Darbar’ culture in India by Anastasia Piliavksy as a part of South Asia seminar series served only as the right enhancement! The researcher when heard can be easily mistaken to be a South Asian, what with her thorough understanding of the subcontinent and more so with a panache with which she handles a phenomenon that is so close to South Asia. As Ms. Piliavksy narrated a practical experience of a Darbar setting in a village in Rajasthan, I sat there wondering if it was the same country I belonged from – a democracy within which are layers of patronage and hierarchy that reign supreme and function in their own rights! It seemed a virtual tour into a King’s darbar as he sits doing welfare and straight out of one of the pieces from Indian mythology on Lord Rama that I perform where the literature describes Rama entrusting the people of his kingdom that he would rule with just! I just contemplated – role play? Characterization? Reality? Fiction? Is it a dual life that we live? I shall limit this sense of over enthusiasm with a mention of tunes of Ghazals that ring in my ears from a session by Ustad Raza Ali Khan. He gave an impromptu rendition of a poetic verse of ‘Daag’ to start off with, whose compositions are a part of the Urdu study program. The next two compositions mirrored the signature and style of his Gharana aiding as answers to questions on differentiation of the styles and mode of rendition that was discussed in an interactive Q&A session. From an insanely busy life in an Indian set up, always trying to juggle multiple things, shifting base to Austin, still seems a heavy decision but for these moments. I experience how art overcomes boundaries of culture, caste and language to serve as a powerful source of knowledge and peace. All this earlier were a part of quotes and prologues read but this for sure gave a personal essence.